Does it feel like Fall to all of you? Yes, there are the pumpkin patches inviting everyone to make jack-o-lanterns. And yes, pie recipes are featured in every cooking magazine. And sure, you can feel the holiday season approaching. But where I am, it’s 75 degrees. The leaves are, well, green. And wearing boots makes me feel a bit overheated. I need the fall weather! I need the crisp air and the chilly mornings and the smell of snow approaching. I need that! Mostly to justify making comforting fall foods. Soup is calling my name! I’ve had chili ingredients for a couple of weeks. Sweet potatoes must be roasted. So I did what anyone would do in this situation. I pretended. I turned on the AC and made what I believe is one of the coziest foods of the season: quiche. Okay, arguably, quiche is summer food. But let’s discuss. A cheesy, savory, egg-based cream custard baked at high temperatures that you eat while still piping hot! How can this be summer food?? 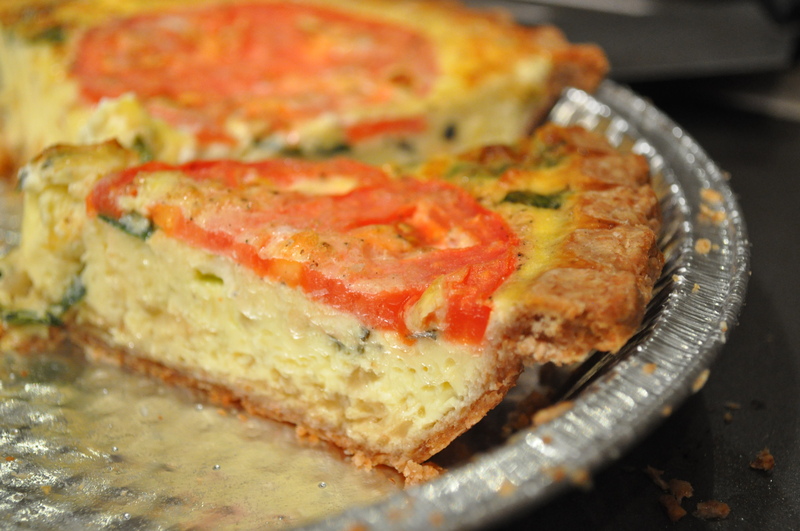 Sure, it can use fresh herbs and vegetables that may only be available in the summer time, but quiche is cold-weather food at heart. Believe it. 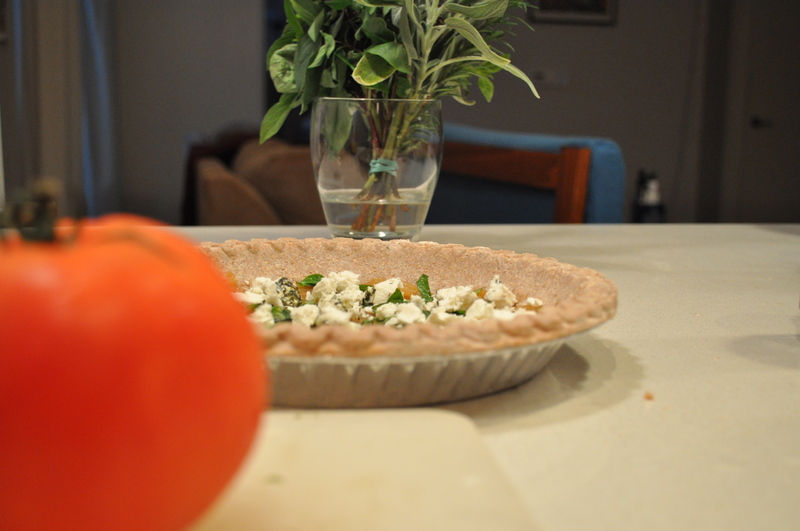 With this said, I used fresh basil and tomatoes in my quiche. 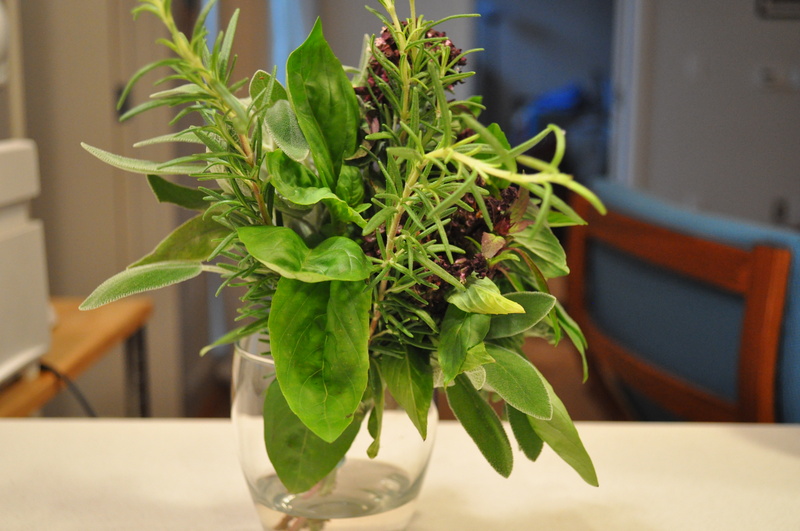 But, I had an excuse: I had a lovely gift of a a mixed herb bouquet with extremely fresh green and opal basil, so I had to use one of the greatest flavor combinations in history: tomato, basil, and goat cheese. I am predicting that the thermostat will inspire more fall-like foods…and hoping that the outside temperatures will soon catch up. 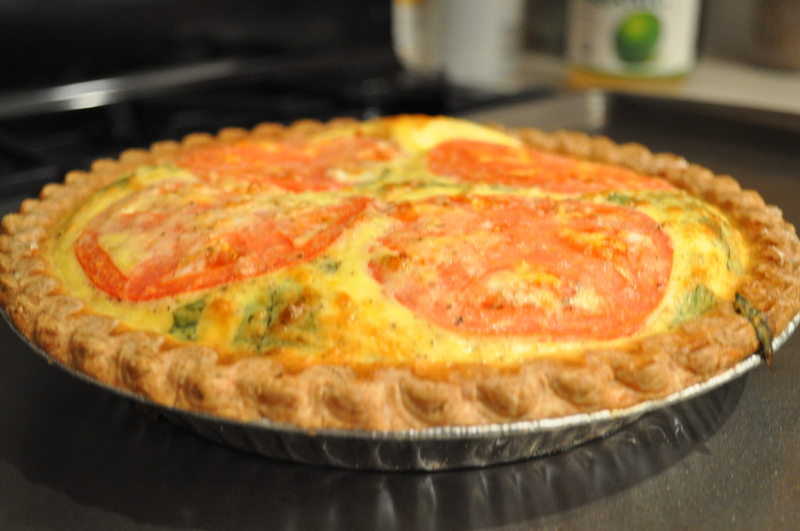 This quiche is infinitely adaptable to anything that is readily available. I used a store-bought crust for an extremely quick meal, but the crust used in the fig galette would be quite scrumptious with this filling. Just press into a tart pan and omit the sugar. 1. Preheat oven to 350 degrees. Heat a pan over medium-low heat and add olive oil. Once the oil is hot, add onions and slowly saute them until caramelized and light brown in color, about 20 minutes. Add salt, to taste, and set aside. 2. Spread the onions onto the bottom of the crust. Sprinkle basil leaves and goat cheese evenly over onions. Arrange sliced tomatoes on top of the filling. 3. In a separate bowl, whisk together eggs, cream and milk. Add salt and pepper to taste. Carefully pour the egg mixture into crust. Sprinkle parmesan on top of the egg mixture. 4. Bake at 350 degrees for 25 minutes. Turn the oven up to 425. Bake for an additional 15 minutes until the filling is set and browned on top. Let rest and cool for 15 minutes before slicing. This entry was posted on	October 22, 2010 at 10:32 pm	and is filed under pies and tarts, savory, Uncategorized. Yummm…it’s like being back on Avenida Sante Fe allll over again. Good work, friend. tomato, basil and goat cheese may be a great flavor combo, but the key to this recipe is the caramelized onions! yum! Pooja, I get inspired every time I read your blog! We’re going to have to try this one — looks amazing!